The title clearly suggests that CD or DVD replication is different from CD or DVD duplication. 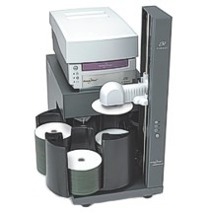 In CD or DVD duplication, replication is done professionally and duplication can be done at home. CD replication is a different process entirely from duplication. CD duplication uses CD or DVD writers to burn the desired content onto a regular sized disk of 700 MB or so. A CD-R disk which stands for Compact Disk recordable and a CD-RW Compact Disk rewriteable can be used for duplication whereas replication requires the help of a professional. To make a replica is to create in one’s own image and likeness. Therefore a CD replica or a CD replication clones the exact copy of the content or the master CD that you have provided. A CD or DVD which is being replicated, will use a glass copy of your content, and stamp it on other CDs or DVDs to produce high quality copies of the original. While copies can be mass produced, there is specific attention paid to the packaging as well as the printing of the final copy of the CD/DVD. These copies produced using replication, are not only a copy of the original content but also give your finished product a highly professional look, especially if you are in the software vending business. CD burning or CD duplication is easy, and can be done at home easily; however the task becomes an uphill one when you have a large number to copy. In case you happen to need a large number of copies, you will need to consult a CD/DVD replication service. This entry was posted on Friday, July 31st, 2009 at 10:15 am	and is filed under CD Replication Articles.